In every state, an individual has the right to make a will. Each state has laws that provide will makers -- known as "testators" -- with specific requirements concerning what makes a will valid. For example, "testamentary capacity" is required in all states. 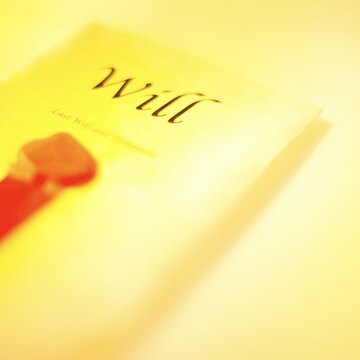 This simply means that a will maker recognizes the implications of making a will along with his relationship to the individuals who will be receiving his property upon his death. If a will maker doesn't have the required mental capacity when making a will, his property will be divided according to his state's laws of intestate succession. Although laws of intestate succession vary from state to state, it's common for spouses to have priority over other heirs. A typical intestate law will grant a surviving spouse all of her deceased spouse's property if the deceased spouse has no descendents -- such as children or grandchildren. If a deceased person has children, many states grant a portion of the estate to the surviving spouse and a portion to surviving children -- generally, intestate laws mandate that children receive equal shares. It's also common for children to inherit a deceased parent's entire estate if their parent wasn't married at the time of death. Most states give parents priority over other relatives -- unless there are children or a surviving spouse -- when a child dies without a will. For example, it's common for parents to receive a portion of their child's estate if their child left no surviving children of his own. In fact, many state laws give parents the right to inherit a child's entire estate if the deceased had no heirs and no surviving spouse. Oftentimes, children outlive parents and state laws of intestate succession provide guidelines for inheritance in these circumstances. When a child outlives his parents, and dies without a surviving spouse or children of his own, his brothers and sisters will inherit his estate. Generally, will makers may leave property to whomever they choose; however, there are some restrictions. For example, a married person cannot completely disinherit his spouse, unless there is a prenuptial agreement. In many states, a surviving spouse is allowed to take an "elective share" of her spouse's estate if her spouse left her a smaller portion than outlined in state law. In every state except Louisiana, a parent may disinherit his children. However, many states presume that a parent who leaves a child out of a will did so accidentally. As such, a parent who wishes to disinherit a child must state so expressly and unequivocally in his will.